Drilling for oil and natural gas is a risky business; that's why National Oilwell Varco and Kinder Morgan take a different approach to making money in the oil patch. If you are interested in the oil and natural gas industry, you've probably considered a driller. However, volatile commodity prices are enough to scare off many investors. That's why you should take a look at companies like National Oilwell Varco (NYSE:NOV) and Kinder Morgan Inc (NYSE:KMI) that avoid commodity risks by helping the drillers get the fuels out of the ground and move them where they need to go. 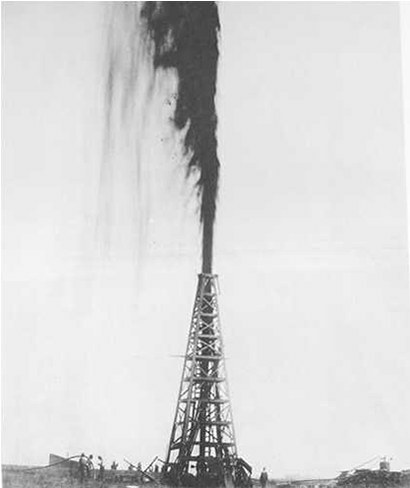 Natural gas has been a huge story in the United States. Hydraulic fracturing and horizontal drilling have opened up exploration opportunities that were previously unavailable. The drilling boom, however, has led to a glut of natural gas. In 2012, gas prices fell to historic lows of around $2 per million BTU. That made it hard for gas drillers to turn a profit. In early 2014, however, some regions of the country faced natural gas prices of over $20 per million BTU because of bad weather. Even areas not hit with record prices were faced with gas prices notably off of their lows. Although oil hasn't been as volatile lately, it also has a checkered past when it comes to swiftly shifting commodity prices. The thing is, gas and oil prices may move up and down, but the demand for these vital fuels will remain strong for years to come. We can't power our homes or drive our cars without them. This means that drilling will continue regardless of the price. That makes providing supplies to drillers a good business for companies like National Oilwell Varco. National Oilwell Varco provides drilling equipment from rigs to pipes. Its business selling rigs, for example, had a record-setting backlog of $16.35 billion at the end of the first quarter. That was up nearly 30% year over year. This segment represented over half of National Oilwell Varco's business in the quarter. However, that's a number that's set to rise because the company just spun off its distribution business. That spinoff should help profit margins, too. Operating profit in the rig technology segment was 21.1% of sales in the first quarter. In the distribution & transmission segment, on the other hand, operating profit was just 5.3% of sales. To be fair, National Oilwell Varco's business will wax and wane as drilling expands and contracts. For example, sales fell in 2009 and 2010. However, that didn't stop the company from initiating a dividend in 2009. It's raised the distribution every year since. Despite the revenue and earnings volatility that some drillers have faced, National Oilwell Varco hasn't earned less than $3.50 a share since 2007. It earned over $5.40 a share last year. National Oilwell Varco is the proverbial "picks and shovels" play. That's not the only way to profit from oil and gas drilling, however. Kinder Morgan, through its various controlled companies, owns more than 80,000 miles of pipelines and 180 terminals. The vast majority of its business is about getting paid for letting other companies use its facilities to move oil and gas from where it's drilled to where it's processed and/or used. In January, Kinder Morgan CEO Rich Kinder estimates that Kinder Morgan moved, "an all time record" amount of gas -- roughly, get this, "a third of all the natural gas consumed in the United States during that month." The best part is that it didn't matter what the price was, Kinder Morgan was getting paid just for letting the gas flow across its pipes. Since National Oilwell Varco's record backlog suggests that there's plenty more drilling ahead, Kinder Morgan's pipes are likely to be filled for years to come. To put some numbers to that, Kinder suggests that industry watcher Wood Mackenzie's estimate of an over 30% increase in natural gas demand over the next decade is understating the true growth potential. That would be good for Kinder Morgan's pipes and National Oilwell Varco's rigs. If you're like me, you find huge price swings like the one in natural gas a little frightening. That's why companies like Kinder Morgan and National Oilwell Varco are so interesting. They let you participate in an industry that's vital to the world, but protect you from the extreme swings that drillers face as oil and gas prices move up and down.